Canberra’s Muslim community is once again inviting all interested Canberrans to register online to join them in breaking their fast at the annual Ramadan Iftar in the City, between 4.30 pm and 7 pm in Civic Square on Saturday 10 June. But you can’t just rock up at the last minute in usual Canberra fashion, you must register online to be part of this auspicious breaking fast ritual. Having attended these events before they were open to the public I can say I have very fond memories of a delicious Canberra Iftar I attended a few years ago where the former US Ambassador to Australia Jeffrey Bleich* was the guest speaker. He raved on about how awesome it was to be posted in Canberra, how welcoming the many members of our multicultural community were to him and his family, and how Australia should be proud of its achievements as a multicultural nation. Although I’m more bogan than wog, I agree with him. I reckon we are very lucky in Canberra, with our embassies, our cultural and artistic institutions and our variety of ethnic food outlets for such a small city. Rarely a week goes by without the opportunity to try new food and other cultural experiences. Many people know I’m already a sucker for a decent kebab or HSP, but writing this made me think – what is a classic Catholic food or meal? Is it wafer-thin rice crisps? Until I find a better answer, I’m going to suggest it is wine and seafood. Although I’ve often described myself as a “bad catholic” I’m always up for a large religiously inspired feast. I know it might upset my parish priest to say it, but my fondest memories of Christmas and Easter revolve around food, shared with family and friends. Sure I understand the value of religion, but is it such a bad thing to view it through the prism of food? Should I feel some guilt? Probably, being Catholic and all, guilt is a part of my brain’s normal processing. So if you have paid attention to the two previous subtle links and registered on Eventbrite for the Iftar feast on Saturday 10 June in Civic Square, and you haven’t attended before, what can you expect? 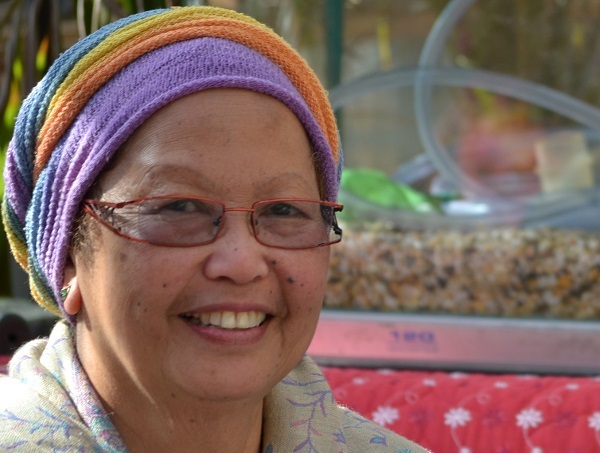 I asked one of the local organisers Zuraida Shelmerdine about Iftar in Canberra. Thanks for taking the time to help us better understand Iftar Zuraida. What is Iftar? How does it help break down barriers and stereotypes? In the Holy month of Ramadan, Muslims observe “fasting”. The Arabic word for fasting is “Sawn” meaning ‘to refrain from’. Apart from abstaining from food, devoted Muslims are expected to restrict themselves from drinking, smoking and participating in sexual activities. All Muslims are required to observe fasting except for children who are yet to attain puberty, individuals who are sick, old or travelling. This is in fact “Jihad” (Jihad is an arabic word, meaning struggle or striving). A Jihad within oneself, of patience, endurance and merciful. The main aim of fasting is to help people inculcate the habit of self-restraint in them which is considered to be a virtuous quality according to doctrines of Islam. Before fasting begins, we prepare ourselves with a meal, something like the olden day’s breakfast, a good nutritious meal called “Suhur”. This meal has to be taken before dawn. Fasting then begins till sunset. The breaking of the fast is called “Iftar”.Traditionally we break our fast with dates and milk. Many affluent communities try to include the needy persons in the Iftar and meal afterwards as charity. Who is celebrating it and who are the key organisers in the Canberra Islamic Centre (CIC) this year? Is it true you’re expecting 3,000 people! This year celebration of Iftars is being held daily by the Spence Musallah, on Saturdays at CIC and Sundays by the Canberra Muslim Community of Gunghalin at the EPIC Centre. Iftars at the CIC will be on 3 June 2017, hosted by the Pakistani Community; 17 June 2017 by the African-Mediterranean Community and 24 June 2017 by the Bangladeshi Community. Of course we have Iftar in the City on 10 June. How many muslims are there in Canberra? To tell you the truth, I don’t know the exact number. There is a large community in the Gunghalin area. That is why there is a need for a Masjid (Mosque) there. Iftar in the City is not catering for Muslims only. It is an event to build bridges with the non-Muslim to break fast (Iftar) together in a peaceful and harmonious way. Homeless individuals from both St Vinnies and Salvo have been invited to join us at this Iftar. I really hope they will come to this event. Where do people celebrate it in Canberra, are there other events around Ramadan as well? The Muslim communities hold Iftars at various places. At Spence Mussalah. The Canberra Muslim Community of Gunghalin has their Iftars weekly at the EPIC Centre and CIC at our Centre in Monash. I also know that The Australian Malaysian Muslim Family Association (AMMF) will hold Iftars on 3 and 17 June at the Malaysian High Commission and the Australia Indonesia Muslim Foundation, ACT (AIMF-ACT) hold theirs at the Indonesian Embassy on Saturdays as well. AMMF also hold food bazaar at the car park compound of the Malaysian High Commission, selling traditional and modern Malaysian cakes and Malaysian cuisine. Why is Iftar important in the Muslim faith? Can it be compared to other feasts in other religions, both in significance and meaning? Well, after refraining yourself for almost 12 – 14 hours from food (We are lucky this year, Australian Muslims are fasting in winter when the day is shorter than in summer) I would imagine the need for sustenance is pretty high. God does not want you to suffer, humans need sustenance, so Iftar is necessary to break your fast. In countries where the days are longer, e.g. Alaska, Norway, they are recommended to break their fast with the next closest Muslim country. I know the Christian faith do fast during Lent and Jews fast too, but on certain days. We are all from the Abrahamic belief, hence fasting has always been prescribed to all humans in one way or the other and one does it according to one’s belief. How is the way Muslims in Canberra celebrate Iftar different from others around the world? Or is it very much the same? I suspect the multicultural nature of the local Muslim community makes the food much more interesting and varied? We celebrate Iftars almost the same everywhere in the world. It is the dinner after Iftars which might be different from countries to countries. Some have normal meals, other have exotic/scrumptious dishes, ones which one don’t normally cook. It is interesting to see what is brought to the table. Muslims observe the lunar calendar, so our fasting days could vary from 29 – 30 days. Most countries still go to sight the moon before they end their fast. At the end of the 29 or 30 days, we celebrate the first day of Shawal call “Eid Fitr”. Community prayers will be held. CIC normally hold Eid prayers at CIC. We adorn ourselves with clean, beautiful clothing and visit one another. The spread of food is again different to the ones we find at the dinner table during the fasting month. I might just string you along to some of the houses I get invited to, for you to experience Eid Fitr. So here you have it Canberra! Everything you needed to know before you enjoyed this unique opportunity to feast for free with our Canberra Muslim brothers and sisters. 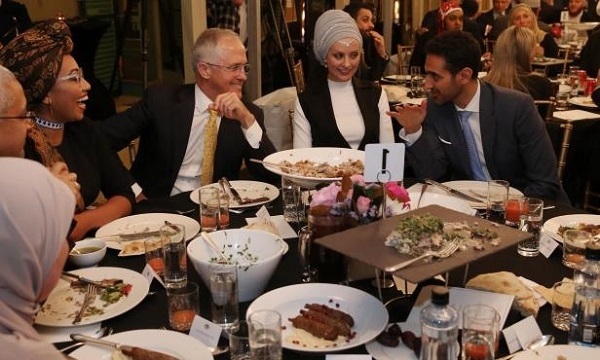 Don’t let Yassmin Abdel-Magied, Malcolm Turnbull, Susan Carland and Waleed Aly have all the fun during Ramadan Iftar. Join in! I should also mention that Zuraida Shelmerdin is so generous and welcoming that when I asked her if it ‘would be possible for RiotACT readers to register a little bit later than on her advertised flyers’? She said she would ask her IT guy to extend the deadline for registering this event until Saturday night – so get to it RiotACT readers and let all your friends know as well! *Jeffrey Bleich was a great Ambassador and passionate member of the Canberra community from 2009-2013. Very smart guy. Some readers might be interested to know he is also running for lieutenant governor of California now! Elias Hallaj (aka CBRfoodie) is a part-time food blogger and full-time political staffer who has joined RiotACT as a regular contributor. All his opinions about halal food, scallops, catholocism, beer and chooks are his own. He often wishes he had more time to cook and eat. If you have any tips or feedback you can find him on Twitter @CBRfoodie.